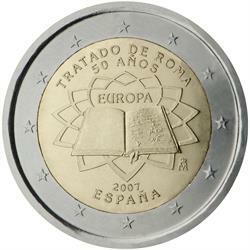 Home > €2 euro coins > 2007 > 2007 Spain €2 UNC Coin "Treaty of Rome 50 Years"
Issue limit: 8 million pcs. 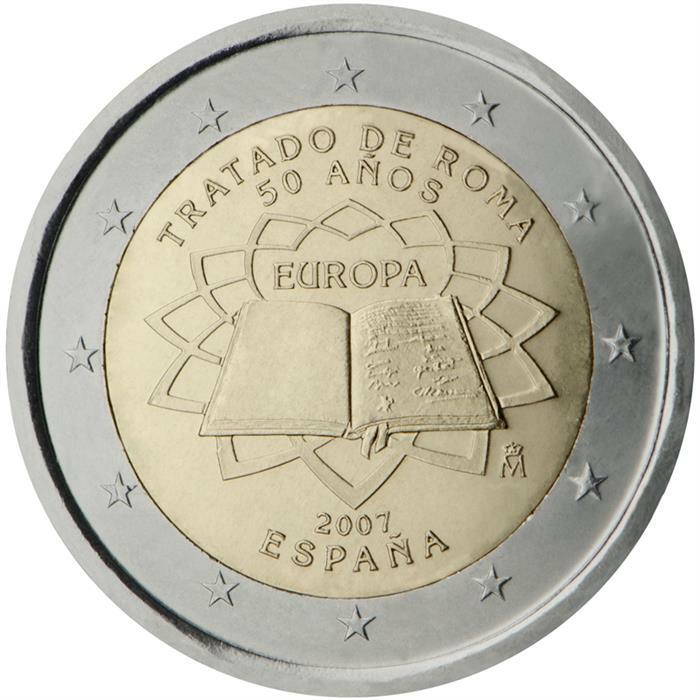 This pan-European issue celebrates the 50th anniversary of the signing of the Treaty of Rome by France, West-Germany, Italy, Belgium, the Netherlands and Luxembourg on March 25, 2007. Similar coins will be issued by all 13 of the Eurozone countries, in addition to San Marino, the Vatican and Monaco. The Treaty of Rome established the European Economic Community (EEC) and was signed on March 25, 1957. The treaty has later been amended by numerous treaties, especially the Treaty of Maastricht in 1993. Another treaty that was signed in Rome on the same day established the European Atomic Energy Community (Euratom), and the Treaties of Rome were subsequently ratified by national parliaments during the following months and came into effect on January 1, 1958.